This summer we stayed at home instead of going away and I have really enjoyed making new recipes and turning the excess fruit into food for later, including labna, kefir and green drinks, and my usual plum products. I must say I only ever make things that are no fuss and easy to make, and also easy to use later. 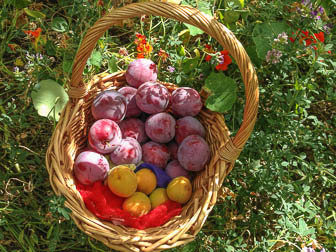 Plum/peach produce – I put the plums (or peaches) – skins, seeds and all – in a saucepan with just enough water to cover, and then cook till soft, no sugar. I then take out the seeds and using muslin, separate the juice from the flesh and put the “juice” in a bottle for fresh use, or to freeze. The “juice” makes a lovely cordial – with or without honey as a sweetener- with soda water. Drinking wine in summer seems to overheat me and that drink makes me feel like I am having a wine without the after effects, and it’s very refreshing. The flesh I put in ice block trays and when frozen transfer to plastic ziplock bags so that later I can take out a couple to add to smoothies. I don’t cook the very soft peaches, but just blend and put in trays. When the kids were smaller I made ice blocks from blended peaches in ice block moulds, and all the visiting kids loved them too. I also made a sorbet with the “juice”. I added some honey to the “juice” then froze in ice block trays. I blended the frozen liquid long enough for the ice crystals to disappear … takes a minute or two. Much better than bought sorbet. Labna – drain plain yogurt in a muslin-lined sieve for a day or two in the fridge – lovely with honey or great as a savoury spread with garlic and herbs on crackers, and in potato salad instead of mayonnaise. Kefir – see http://www.culturedfoodlife.com/the-trilogy/kefir/what-is-kefir – it’s easy and a great thing to make … with the benefits of yogurt, but many times better. You can buy starter probably from health food store or online but I got my starter grains from a friend. I add it to smoothies and green drinks. Green drink – Blend some coconut water, greens from the garden – perpetual spinach, kale, parsley – and some kefir. Great start to the day and tasty. Home-made crackers have been very successful too. Seed Savers Albury-Wodonga member Sue Brunskill wrote this article for the Living Lightly column that appears each Saturday in the Border Mail newspaper. All Living Lightly articles are accessible online at Ecoportal.net.au/living-lightly. This entry was posted in Garden harvests, Member news and tagged fruit, harvest, homegrown by Seed Savers Albury-Wodonga. Bookmark the permalink.